The HRD's mission is to develop Antwerp as a world diamond center by representing the diamond sector in Belgium and abroad to public governments and diamond organizations. 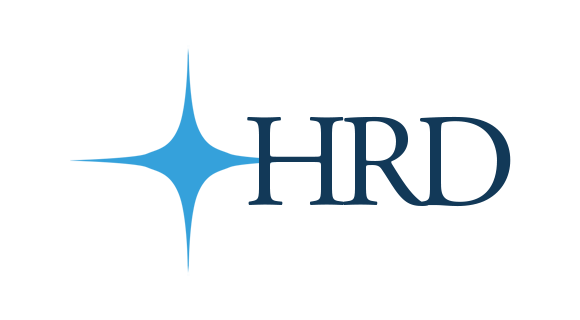 Furthermore, they also strive to increase industry knowledge by conducting thorough research in manufacturing and trade efficiency. 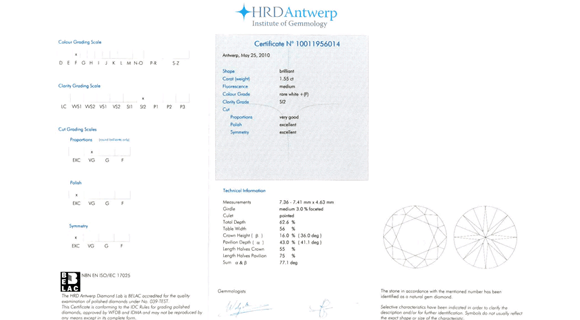 The Hoge Raad voor Diamant (HRD), translated as the 'Diamond High Council', was established in Antwerp in 1973 as the European counterpart to the GIA (Gemological Institute of America). In addition to monitoring the import and export of more than half of the world's loose diamond supply, the HRD issues widely recognized certificates for diamonds and gemstones based on internationally accepted standards. Learn more about the diamond reports issued by the HRD below. Diamonds are analyzed by several expert gemologists using state-of-the-art laboratory equipment. Many gemologists must agree on the collective quality of a diamond before a grading consensus is reached. To ensure adherence to stringent standards, senior gemologists randomly monitor grading results for accuracy and consistency. The origin of the diamond is determined through thorough investigation, and steps are taken to certify the stone as a natural diamond. A diamond's carat weight is measured using carefully calibrated gemstone scales, and is noted up to the fifth decimal. The diamond's measurements are taken and fluorescence, if any, is described. The color of a diamond is graded on a scale ranging from Exceptional White to Tinted Color. The GIA's D to Z equivalent is noted as well. Clarity is determined on a grading scale ranging from Loupe Clean (flawless) to P3 (imperfect) based on the number, size, brightness, and location of internal and external characteristics. Any detected inclusions are plotted on a diagram. The proportions, or cut grade, of a diamond are determined as Very Good, Good, or Unusual based on a combination of the stone's girdle thickness, culet, table width, crown height, and pavilion depth. 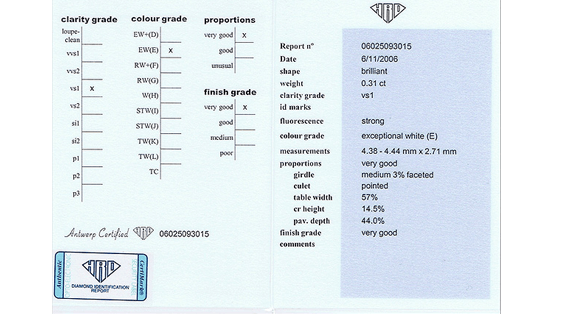 A diamond's Finish Grade is determined on a scale ranging from Very Good to Poor. This rating is based on the quality of the workmanship of the diamond polisher. The HRD Diamond Certificate, offered for all diamonds, certifies the stone as a genuine diamond. It also contains a detailed quality description based on the 4C's (cut, clarity, color, and carat) and includes a plotted diagram. The Diamond Identification Report, offered for diamonds measuring up to one carat, is a compact document that contains the same detailed information noted in the Diamond Certificate, without a plotted diagram. More than 50% of the world's production of rough, polished, and industrial diamonds passes through Antwerp.